Volvo S60 driven | What Car? 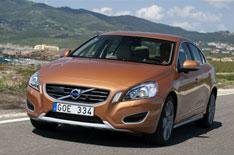 The Volvo S60 is the company's answer to the BMW 3 Series and Audi A4. We've been to Portugal to get our first impressions of the new Swedish compact executive. Everything. The outgoing S60 had changed little since it was launched 10 years ago, so it's no surprise that the all-new model is a big step forward. There's its sleek styling, for a start, along with a range of efficient engines and some advanced safety kit. As with just about every new car these days, Volvo is making a big noise about how much sportier the new S60 is. In truth, the new S60 is undoubtedly a lot more fun than the old one, but Volvo's achievements go further than that, however, because it now feels competitive with key rivals such as the Audi A4 and Mercedes C-Class. It handles well, with plenty of grip, and although the steering isn't as weighty and full of feel as a BMW 3 Series', it's good enough. It doesn't feel like Volvo has built a car to go head-to-head with a 3 Series, though. Rather, it's a car that builds on Volvo's traditional strengths, but adds a little extra sharpness, and that's not necessarily a bad thing. Most impressive is the ride quality, which was consistently good on the Portuguese roads we drove on. Refinement is good, too, with little road noise, even on poor surfaces. Of the two diesel versions that go on sale at launch, we'd recommend the new D3 model that's expected to be the best-seller. Its 163bhp 2.0-litre five-cylinder engine provides all the shove you're likely to need. Although its distinctive sound is something of an acquired taste, it's mostly unobtrusive. We also drove the D5 model, which has a 205bhp 2.4-litre diesel engine, in 'Geartronic' automatic form. The combination is not as smooth as you'd expect. From launch, the range-topping T6 will be the only petrol model. It has a muscular 302bhp turbocharged six-cylinder engine and an automatic gearbox, along with standard four-wheel drive, but its considerable thirst and high CO2 emissions won't appeal to business users. They'll be more interested in the lower-powered four-cylinder petrol engines named T3,T4, and T5 that will join the range in November. They'll be even keener on the 115bhp 1.6-litre DRIVe diesel version that will have a range of energy-saving features to give CO2 emissions of 114g/km. It will go on sale 2011. The cabin is easy on both the eye and the posterior. The S60's interior follows the pattern set by recent Volvo models, with a 'floating' centre console and smart, understated design. The central panel is angled towards the driver and a range of different metallic and wood inserts are available. There's plenty of space for four, along with good quality materials and particularly comfy, supportive seats in both the front and back. The overall impression is of a cabin that will be easy to live with. Prices start at £23,295 for the D3 ES model. Standard equipment includes climate and cruise controls, and alloy wheels. Mid-spec SE models start at £25,295, which adds extras such as a plusher trim, an upgraded stereo and larger alloy wheels. Range-topping SE Lux gains an electrically adjustable driver's seat, leather trim and active headlights. As you'd expect from a Volvo, safety equipment is comprehensive across the range and includes a full array of airbags, stability control and the City Safe system that was launched on the Volvo XC60. The S60 goes further than that, however. It's also available with an options pack that includes Volvo's latest innovation Pedestrian Detection system with Full Auto Brake. A radar unit and camera at the front of the car detect objects in front and if the system senses that there's someone in the road, the driver receives a warning. If there is no driver response, it intervenes and brings the car to a halt. Using this system, Volvo says that the car can automatically avoid a collision with a pedestrian at speeds of up to 21mph. We had the opportunity to test the system on a dummy and found that it works uncannily well. You can combine this system with Adaptive Cruise Control and Queue Assist, a lane departure warning system and Volvo's Blind Spot Information System (BLIS) for £1250 on SE or SE Lux cars, or £1450 for ES versions. The new S60 is available to order now, with first deliveries in August.